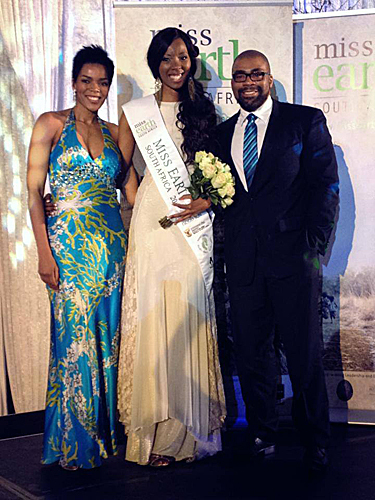 University of Johannesburg (UJ) student Ashanti Mbanga was crowned the new Miss Earth South Africa 2013 at a gala event held at Monte Casino in Johannesburg on Saturday, 17 August 2013. Mbanga, 24 years old, is currently completing her degree in Transport Economics, and later hopes to use her qualification to pursue a political career in the transport sector. Being a young woman who believes in protecting nature and the environment, Mbanga aspires to affect change in the sustainable transport sector as the Minister of Transport. With such vision and ambition, it’s not hard to understand why she walked away with the crown. UJ is proud to honour an outstanding young woman, especially with this month being the month to celebrate women. We wish the new Miss Earth South Africa all the best as she goes on to represent South Africa at the International Miss Earth contest in Southeast Asia later this year. Mbanga takes over the reins from former Miss Earth South Africa 2012 Tamerin Jardine, a law graduate and alumnus of UJ. See more at the UJ website.